We are excited to announce that to better serve our patients we are expanding and renovating! We are excited to announce the newest addition to our skilled pediatric dental team, Dr. Rachel Goldberg! Dr. Rachel Goldberg graduated from the University of Manitoba in 2013 with a Bachelor of Science degree. With a strong interest in healthcare, Dr. Goldberg went on to complete her formal dental education at the University of Manitoba in 2017, receiving her DMD with Honours and B.Sc. (Dentistry) degrees. She earned the Academy of General Dentistry Award for the student who shows the most promise of being an outstanding general dentist, the American Association of Orthodontics Award for exceptional interest in the oro-facial complex, and the Golden Scaler Award for high standing in the fourth year clinical periodontics course. After completing a research project during her time spent in dental school, Dr. Goldberg developed a strong passion for dental research and continuing education with the goal of ensuring her patients receive the best care possible. In her spare time, Dr. Goldberg enjoys spending time with her family and friends, exploring Winnipeg’s food scene, traveling, walking her dog, and reading a good book. She is also an avid sports fan and loves to watch both hockey and basketball. Dr. Goldberg is excited to welcome new patients to her practice! Congratulations to Milana, Sascha and and Rusty - recent winners of our random monthly prize draws!! A BIG congratulations to Tanner, Paul and Zara - recent winners of our random monthly prize draws!! Our Dr. Carla Cohn was recently designated one of Dentistry Today's 18th Annual Leaders in Continuing Education. Congratulations Carla! Our own Dr. Carla Cohn was recently interviewed on Dentistry Uncensored with Howard Farran! Congratulations to Nicolas! Nicolas was drawn as a random prize winner for completing his Brushing & Flossing Diary. Keep up the great work! Our fantastic front desk staff, Tammy and Courtney, in full Halloween mode! We make your kids' dental visits fun! 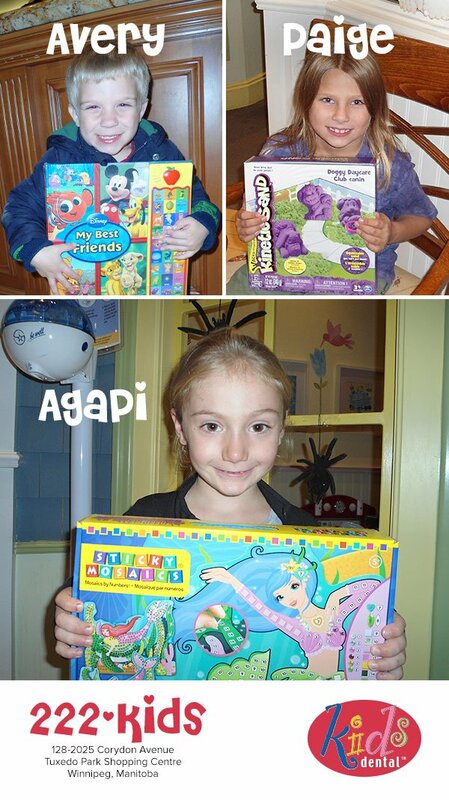 Congratulations to our latest monthly prize draw winners, Agapi, Paige and Avery — all three were cavity free! Great job!! 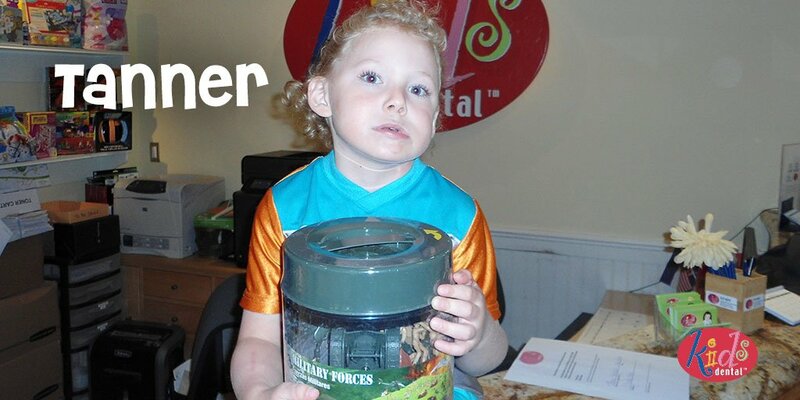 Leo won our monthly random prize draw for having NO CAVITIES! Awesome job, Leo! Enjoy your prize. We make your kids' dental visits fun! Dress them up to match our daily costume themes for Halloween Week, from October 26-30! Congratulations to Robin who won a monthly prize for being cavity free! Yaaayy, Robin!! Keep it up! A star is born! Our very own Dr. Katie Davidson is starring as Inga in an all-dentist production of the Mel Brooks musical, "Young Frankenstein". The show runs from April 9-12, 2015 at the Shaw Performing Arts Centre at The Forks (home of Manitoba Theatre for Young People). Proceeds from this project go to support children and inner-city children’s dentistry. Prize winner, Maeve, won her prize for completing a brushing & flossing diary. Great job, keep it up! Jamie won his prize for completing a brushing & flossing diary! Way to go Jamie! Congratulations Eli! Eli was a prize winner for being cavity free... great job! 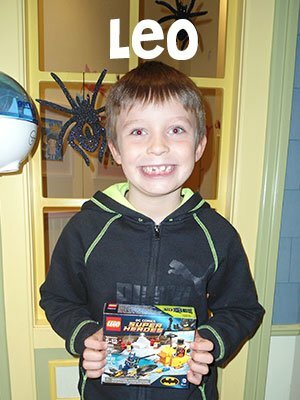 Congratulations to Nolan, who won his prize for being cavity free! Way to go Nolan, keep it up! Congratulations to Kaitlyn, who won her prize for completing her brushing & flossing diary! Congratulations to MacKaila, May's prize winner for stopping sucking her thumb! Way to go! Congratulations to Brenna, May's prize winner for being cavity free! Great job - keep it up! Check out our own Dr. Carla Cohn on CTV Winnipeg speaking on the importance of preventative dental health for children! Come in costume when you come for your appointment! The latest colouring pages from Natasha's school visits. Great Job! The kids thank you letters are the proof of your great work. Dr. Davidson has launched a beta website for herself. Check it out, and let us know your thoughts on your next visit. Would you like to see one for each dentist? We've upgraded the two larger TV's and the XBox 360 Kinect is now up and running! Come on down to see our wonderful facility. Kids Dental welcomes Dr. Katie Davidson! Dr. Katie Davidson received her Bachelor of Science degree from the University of Manitoba in 2008 and completed her formal dental training in 2012, graduating with honours and receiving her DMD and B.Sc. (Dentistry) degrees from the University of Manitoba. She was awarded with the American Academy of Pediatric Dentistry (AAPD) Predoctoral Student Award and the Martin Nevile Award for outstanding work in the field of dentistry for children. Katie is involved in dental research with the Manitoba Institute of Child Health (MICH) with particular focus on early childhood tooth decay and presented her current project at the 2011 Canadian Dental Association convention in Halifax, NS. When not practicing dentistry, the former All-Canadian U of M Bison volleyball player enjoys training for triathlon. Katie is excited to be working with the Kids Dental team and is happy to welcome new patients to her practice! It's that time again... time for a teddy bear's picnic! Please join us at the Convention Centre on the 25th and 26th of February for the Baby and Kids Show! Along with the other wonderful and numerous booths for new and upcoming parents, we will have a large section for parents to come and learn about good dental hygiene, and some free stuff for the kids as well! Time for an update! Recently, we've added a few new and exciting things to our kids play room! A new library of movies and games will be coming out over the next week or so, and even an XBox Kinect system! Natasha continues to do great work for the schools, and educates children about proper dental hygiene. Just look at this wonderful evidence! 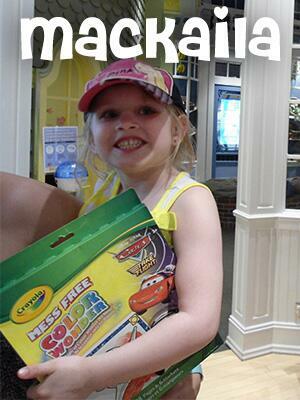 Our latest winner at Kids Dental! Here are the August monthly prize winners for the girls! Dr. Carla Cohn has been invited to some important lectures on children's dental health coming up around North America, including one in Winnipeg! Recently, our hygiene coordinator Natasha Kroeker received praise from the St. James-Assiniboia School Division for her dedicated services to the schools. There will be more about her dental hygiene work published in the October issue of Contact!, the local area newsletter in St. James. Congrats to Natasha on her hard work! Dr. Cholakis and Dr. Cohn recently went to Athens Greece to present their findings and positive patient results with regards to Caries at the International Association of Pediatric Dentistry Conference. It was Pajama Theme Day. We are such a comfortable work environment. The staff seemed to really enjoy this theme. See Dr Amanda Huminicki and a patient in their comfy attire. We are thrilled every time we see our patients who have great checkups and especially a no cavity check up. Joshua's "No Cavities" ballot was pulled from our Kids Dental draw box. Congratulations and great work Joshua. Crazy Hat Day was too much fun. 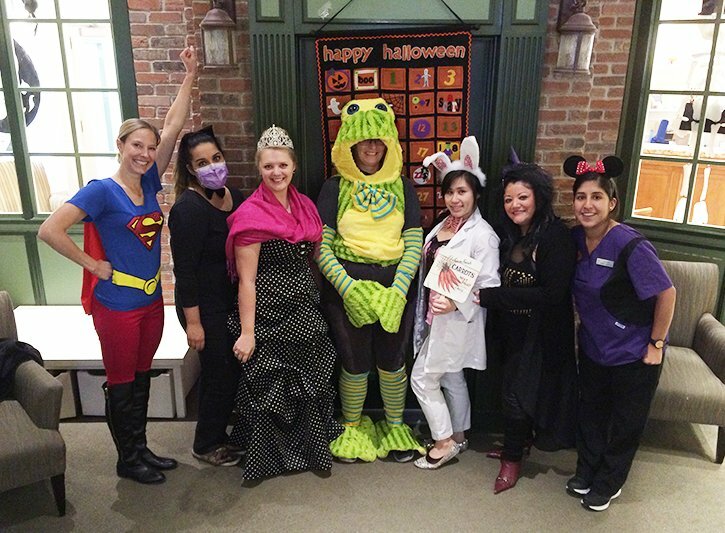 See some of the kids and staff having fun with this Kids Dental theme day. Happy New Year. What could be better...wearing your pajamas to your first dentist visit of the year. Our theme days are truly a hit with everyone. Scroll down to see the theme day list and be ready for the next one. Kids Dental® Educational and advocacy programs playfully educate children and their parents on healthy eating habits and proper dental home care. 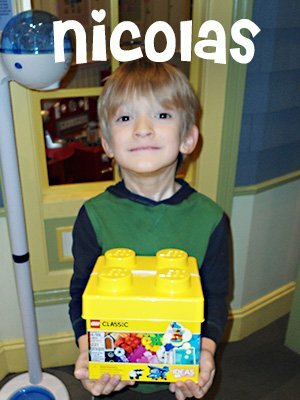 Kids Dental educational program brochure. The Kids and Staff are already having so much fun with our theme days. Watch for the next theme and let's see who shows up in their pajamas. See some of the staff and kids below - very pretty princesses. Kids Love to play and have fun (so do we) so we've decided to create Kids Dental theme days. With each theme day there will be a little something special for the children who participate. So if you see the staff all dressed like their favorite superhero or wearing a funny hat, you'll know why. See the list of dates and themes below and join us in the fun. By popular demand from our patients we have upgraded our selection of games. We have recently added three new games for the kids of all ages to enjoy. We notice that the parents are very happy to be playing while their children are being well attended to during their appointment. We encourage the child in all of us to relax and enjoy this unique children's dental clinic. Who says going to the dentist can't be fun! 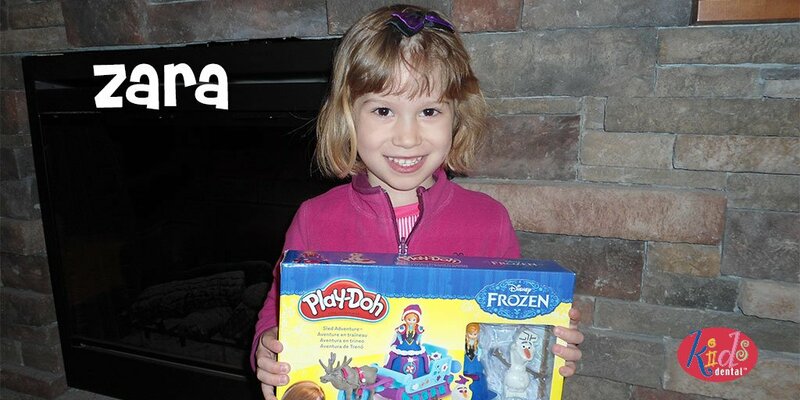 Our recent grand prize winners of a $50 ToysRus gift certificate. Congratulations Alexandria - No Cavities ballot and Amber - her completed brushing and flossing ballot. Their ballots were the lucky ones pulled from our in-clinic draw box. See all the past prize winners here. We are honored to receive this letter from St James School Division, Chief Superintendent, Ron Weston. Thank you Ron on behalf of all the staff at Kids Dental for letting us encourage and support the great students and faculty in dental health programs. 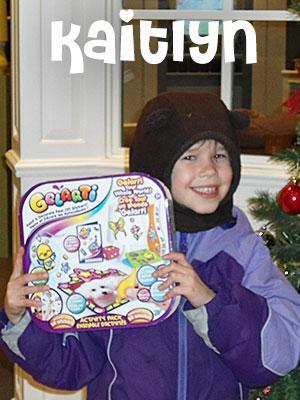 Our newest Bonus Prize draw winner - Rekai. Congratulations Rekai and keep up the great work on your dental health. Our June Bonus Prize draw winners have been picked and they are starting to come in. See the link below to view Dr Carla Cohn's online interview. New chances to win everyday at Kids Dental. There are now three new ways to gain points for chances to win. Our bonus code program has been expanded and now there are more ways to add to your online points, for more chances to win everyday. See some of the new prize choices here. Congratulations to Lexie - our newest Monthly Grand Prize Winner of a Wii system. Lexie won by playing our Kids Dental online Treasure Hunt Game and accumulating many points. Congratulations and keep playing. See all the prize winners here. Our May Bonus Prize draw winners have been picked and they are starting to come in. See Owen and some of the others below. Kids Dental school program continues to inspire us all. We love the many creative letters and artwork from the students. Thank you. Kids Dental TennisFest kicks off another season of tennis fun. And it's FREE! The First 50 participants at the various locations and events will receive a free kids racquet. 1st Kids Dental TennisFest planned for 2010 happens this Sat May 1st at Winnipeg Winter Club. For more information and locations and to enter to win a Wii visit the Tennis Manitoba website. Good luck and have fun. See Kids Dental Flick page for all the great photos. On April 5, 2010 our team at Kid’s Dental had the opportunity to travel to Cancun, Mexico where we attended a conference on preventative dentistry. Lectures and presentations were given on the latest advances in pediatric dentistry. We were fortunate enough to meet with two of the great founders of early prevention – Dr. Francisco Ramos-Gomez and Dr. John Featherstone. Both doctors commended our office on the protocols and procedures that we have in place at Kids Dental. Drs. Ramos-Gomez and Featherstone were very impressed at how advanced Kid’s Dental is in our implementation of prevention of dental decay. Kids Dental Team also participated in a community service project where we provided dental screenings and prevention to more than 200 orphans and under-privileged schoolchildren in the Cancun area. The entire experience was extremely rewarding. Plans are in the works to attend a mission in 2011 to provide dental treatment to other children in an under-privileged part of Central America. Congratulations to Lily - a Winner of a Wii system. 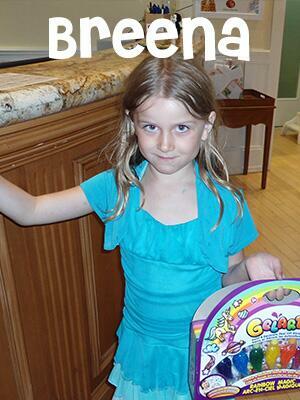 Congratulations Lily for having your brushing and flossing diary chosen as one of our Grand Prize winners. Keep up the great brushing and flossing. Congratulations to James - another Wii winner. Congratulations James - who would have thought a great checkup could be so rewarding. Keep up the great work. Congratulations to Shanaya - our latest Grand Prize Winner of a Wii system. Shanaya is another Toothpatrol member who has won by playing our online Treasure Hunt Game and using her online brushing and flossing diary. Congratulations Shanaya and keep up the great work. Become a Toothpatrol member today. 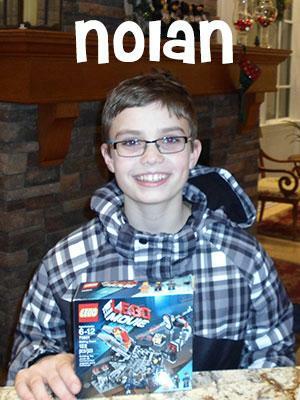 Congratulations to Cole - our latest Grand Prize Winner of a Wii system. Cole won by playing our online Treasure Hunt Game and accumulating lots of points. Along with the Treasure Hunt Game he also has done very well with his online brushing and flossing diary. Congratulations and keep up the great work. The Manitoba tennis community will be Raising a Racquet for Kids on Wednesday, December 2, 2009 as we gather to celebrate the achievements of our top players and recognize the outstanding contributions of our 2009 Manitoba Tennis Hall of Fame inductees. Continuing on the successes of the 2006, 2007 and 2008 Tennis Manitoba Awards Banquets, the Raising a Racquet for Kids presented by Kids Dental event will feature a doubles exhibition match with professional ATP players. Visit the Tennis Manitoba web site for more information. Has your child been on a field trip to Kids Dental Grinich Village or had an inclass presentation? The 2009/2010 school year is busier than ever for our Dental Health school program. The response has been wonderful from teachers and kids alike. We are thrilled to be able to offer this to all schools, from kindergarten to grades six. The children are very eager and enthusiatic when Ashley our dental health coordinator shows up with our fun and interactive presentation. Please ask your child if they've had a Kids Dental presentation in their school. If they've brought a new toothbrush home and a bag full of dental health material then you know they have. Congratulations to Marcus - our August Grand Prize Winner of a Wii system. Wow. We are so excited to be seeing this kind of dental health trend, another "No Cavities" checkup winner. Marcus won by having a "No Cavities" ballot in our draw box. Marcus is shown here with his sisters Calli and Peyton, both eager to help Marcus with his dental health prize. Congratulations and keep up the great work. Congratulations to Christian - our July Grand Prize Winner of a Wii system. Christian won by having his "No Cavities" ballot in our draw box. Great work on your dental health Christian. The more you play the more chances you have to win, so keep playing online and dropping off your completed dental health diaries to add to your ballot points. Congratulations to Madison (left) and her sister Brooke (right) - our June Grand Prize Winners of a Wii system. Madison was our lucky winner by having her completed brushing and flossing postcard ballot drawn from our ballot box. Congratulations Madison, keep up the great work on your brushing and flossing and have fun with Brooke and your friends playing your new Wii system. Thanks to our dedicated and super hard working staff and helpers. The success of this event was because of these wonderful people. Thank you to the staff of Kids Dental and the Teddy Bear picnic organizers who put on a very successful event. We were overwhelmed with the great response at our tent. We'll see you next year at this very worthwhile event. Congratulations to Tianna - our May Grand Prize Winner of a Wii system. Tianna won by having her "No Cavities" ballot drawn from our in-clinic ballot box. Great work on your dental health Tianna. 23rd Children's Hospital Teddy Bear Picnic - Assiniboine Park, 9am to 5pm. Come see Winnipeg's Kids Dental at the Big Red Tooth Booth. We're located right by the very popular B*A*S*H tent. We'll have tooth brushing stations, activities and handouts, dental chairs for your favorite stuffed toy check-up. We're excited to be with Prairie Public TV who will be there with Clifford the Big Red Dog - a children's favorite. He will be greeting all the kids along with his famous signature tattoo. There will be face painting, tattoos, handouts and a draw to enter for a Wii system. Congratulations to Rebecca - our April Grand Prize Winner of a Wii system. Rebecca has collected many ballot points playing our Captain Kids Treasure Hunt game and using the online Brushing and Flossing Diary. Keep up the great work Rebecca and have fun. In association with Tennis Manitoba and Tennis Canada - Kids Dental is proud to be the title sponsor of TennisFest'09: June 6th, 2009, at the Sargent Park Tennis Center. This is a FREE and unique opportunity for children ages 6 to 12 to experience the fun of tennis. The first 500 children will receive a FREE tennis racket. Along with activities and fun on multiple courts. Congratulations Megan, our March Grand Prize winner of a portable DVD player. Megan's points helped her with more chances to win. Have you checked your points lately? The April monthly draw is coming up soon - the more points you have the more chances to win. Good luck! Congratulations Hannah, our February Grand Prize winner of an iPod Nano. Hannah had accumulated tons of points playing Captain Kids Treasure Hunt Game, increasing her chances to win. Congratulations Hannah! Isn't it time you became a Tooth Patrol Member? Click here to see the prizes, previous winners and to register today. Magaret Underhill Grade 2 field trip, enjoying a Grinich Village dental health presentation. Margaret Underhill School and two grade 2 classes, enjoyed a dental health presentation in the Grinich Village. Great enthusiasm and energy was all around as they learned about good dental and nutritional habits. Afterwards the Grinich Village and all it's interactive play areas were well used. Yes that's right, Kids Dental has added a Wii system to the already exciting video-games pavilion. You can now enjoy your favorite Wii sport game and challenge your parents or brothers and sisters. Kids Dental welcomes the Brownies to Grinich Village! We were very excited to host an evening for a local Brownie Group (#47 Westwood). We were thrilled to help support their Badge program and customize brushing and flossing diaries for them. This helped the girls earn their "SMILE GIRL" badges. Along with a dental health presentation by Eva the evening was a blast. Come back soon and keep up the good brushing and flossing. If you are involved in Brownies, Sparks, Beavers or Cubs we are more than happy to support your programs with a dental health presentation in a unique and fun environment. Call 222-kids for more information. We are excited about our enhanced computer lab classroom support. Now when each student signs up to become a ToothPatrol Member they also add their school and teacher name. This automatically enters the classroom into our monthly Scholastic Gift Certificate draw. Good luck. Congratulations to our newest Monthly Grand Prize winner. Caitlin shows her winning smile as she recieved her Nintendo DS and Mario Party game. Don't forget to keep playing, the next time it could be you! We are so proud when we see our efforts making a difference in the community. Come visit us at the Baby and Kids Show at the Convention Centre and see what's new! Kids Dental is excited to be the main sponsor of the Baby and Kids Show 2009 at the Convention Centre. If you visited our booth last year your kids were guided by our experts at the brushing stations; learning good dental health habits. This year in addition to the brushng stations there will be an actual dentist chair and mannequin where kids can use real tools and play dentist and hygienist. You and your kids can also play dental health games on a large touchscreen monitor and become eligible to win great prizes. We hope to see you there. You can view their website here. Kids Dental is proud to sponsor the 2009 Junior Open Tennis Championships - February 12-15th. Kids Dental installs large touchscreen monitors and the kids are having a blast! We have installed touchscreen technology that is exciting for the kids and parents. The parents can go online and surf our website for all their dental health needs and use our online Previstat cavity predictor program while the kids can instantly become tooth patrol members. Kids are playing dental games, updating their personalized brushing and flossing diaries and entering bonus codes that increase their points and their chances to win, win, win. We are proud of our education program and it speaks for itself. See a few of the great students pictures in our YouTooth gallery. Bonus points are here! Watch for yours today. Kids Dental has now increased your childs chances to win with new BONUS POINTS. You can receive bonus points by having a cavity free check-up, becoming a new patient, or filling out your online brushing and flossing chart for a full week. There are many more opportunities for bonus points so watch for yours and start building those ballot points for more chances to win. Good luck. 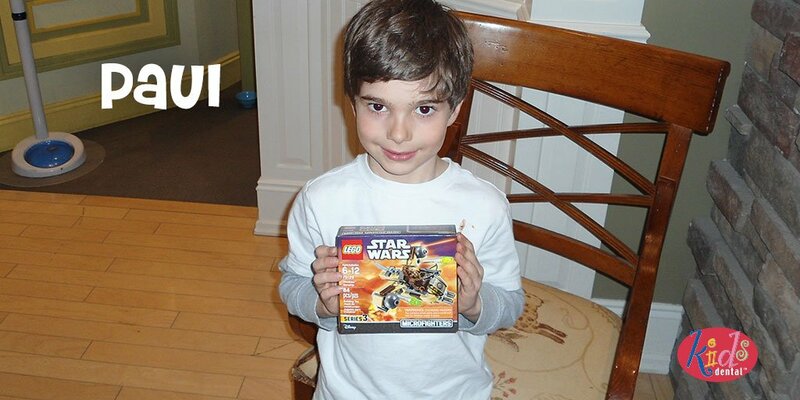 The newest monthly prize draw winner - Jack. Congratulations to Jack as our December monthly prize draw winner. Jack's winning ballot came from a Cavity Free check-up ballot at his last visit. His parents are proud of his great dental health and Jack is excited to be rewarded by having healthy teeth. Make sure your kids are filling in ballots and building up their points with our online games. The more they play the greater the chances for lots of fabulous prizes just like Jack won. See the prizes and past dental health winners. Kids Dental upgrades it's gaming system. We are excited to continually upgrade and refresh our SCUGS gaming pavilion with the newest and coolest games - for kids and adults. Guitar Hero World Tour is now hooked up for all you rock and roll fans and groupies. Come in and Rock-On. Early in 2009 watch for yet another exciting NEW gaming system install. November 15th, 2008 - Kids Dental Celebrates it's One Year Anniversary! In our first year, thousands of children chose to be cavity free. Join us and together we'll make tooth decay history! Kids Dental protects more than just your child’s teeth. Studies are showing that cavity free children are more likely to grow to their ideal weight and height. Emerging research is also linking good dental health with a decreased risk of stroke and heart disease later in life. Come and have your kids brush their teeth at our toothbrushing stations! Make sure you visit our unique Dental Health pavilion where every child receives a toothbrush and toothbrushing instruction by our professional Oral Health Instructors, plus every family will receive a free gift bag full of dental health resources and exciting and fun giveaways! The Baby & Kids Show is proud to support the Manitoba Chapter of the Children’s Wish Foundation as its chosen charity, helping to grant wishes to children suffering from high risk, life-threatening illnesses. Come by our display and learn how your children can be Cavity Free! Kids Dental gives away cavity fighting gum for Halloween. With all the candy that kids will be exposed to during Halloween, Kids Dental is giving away Cavity fighting gum with Xylitol. Xylitol's unique molecular structure works against bacteria. In fact, studies show that 6 grams of the Xylitol found in our gum reduces acid-producing bacteria. By reducing the bacteria, you reduce cavities. At least one treat this Halloween will be a healthy one. Happy Halloween. Kids Dental begins another year of visiting schools with our fun and interactive presentations. Thousands of school kids in 2007 were instructed in proper dental and nutritional health habits. From Kindergarten to grade 6.